When people imagine a modern farmhouse kitchen, few things typically come to mind. Bright rooms with tons of natural light due to well-oriented windows, large islands that fit the family, and farmhouse sinks almost always top the list. The Modern Barn kitchen brings more to the table than these customary elements. Modern Barn kitchens have a distinctly contemporary feeling and are hubs of luxury in addition to being the heart of the home. Some of the basics in modern farmhouse kitchen design are fundamental and true to every original Modern Barn Kitchen. These elements are consistent in modern farmhouse kitchen design. An open kitchen with natural light through large windows are a signature in Plum Builders’ modern farmhouses. Modern farmhouse kitchens embody the family’s need to gather together to enjoy meals and to pass down family recipes and traditions. Expansive islands allow enough space to gather for breakfast during weekend stays, holiday retreats, or summer vacations. They allow family chefs to converse with everyone else while preparing meals. In The Modern Barns, kitchen, dining, and living rooms are combined into one large room, further encouraging connection and discussion. Ample counter space and storage are two additional design staples found in the modern farmhouse kitchens of today. Thus, the kitchen becomes a place for more than just cooking. In a farmhouse kitchen, the design allows for homework, budgeting, games, and plenty of other family activities to be done simultaneously. In Modern Barn kitchens, designers also incorporate pull-down hoses and dual sink islands. Our kitchen design stays ahead of modern kitchen trends in many ways. Every modern farmhouse kitchen in an original Modern Barn is unique, but nearly all are remarkably contemporary and luxurious. 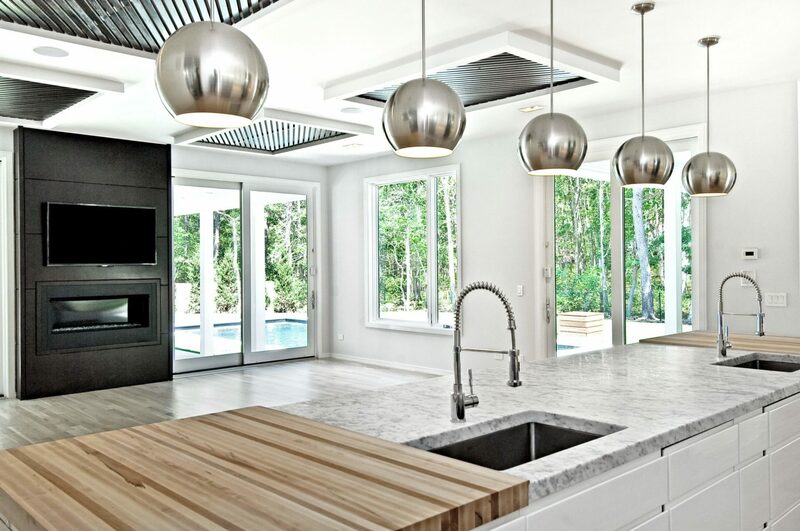 Design teams incorporate Italian ovens, marble countertops, quartz countertops, polished stainless steel, and modern lighting into the kitchens, an intentional contrast to the many rustic elements found in the homes. The Modern Barn Kitchens include sustainable design and materials and are notably low-maintenance. Today’s homeowners want homes that are sanitary. 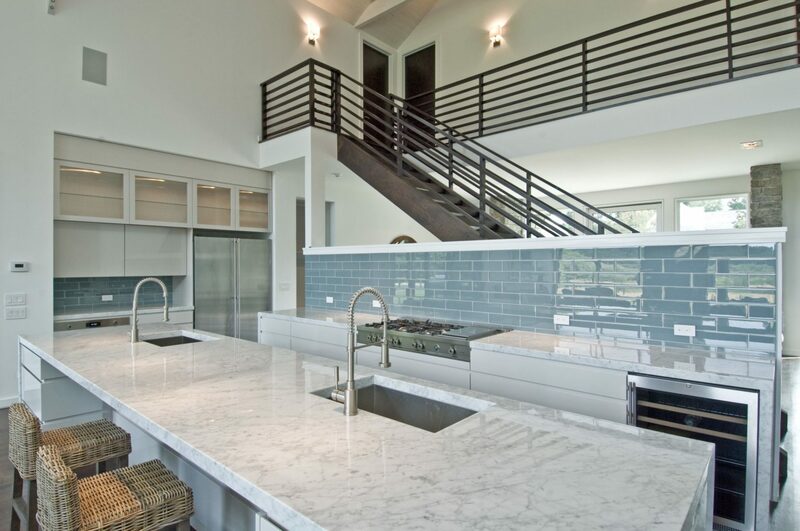 “When it comes to countertops, [homeowners are] interested in something that is clinically pure,” says Al Giaquinto. There’s a common-sense element of the materials used in modern farmhouse kitchens, also. Sustainable, low-maintenance materials improve the value of the home and thus fulfill the demands of future homeowners. Modern farmhouse kitchens typically feature bright white cabinetry and other surfaces, including countertops and walls. In terms of color, designers tend to incorporate color only from natural elements such as wood or metal. Stoves, lighting, appliances, and finishes – such as fancy cabinet door handles – are sometimes the only color in the room aside from the homeowner’s own decor. As a result, modern farmhouse kitchens look brighter, cleaner, and larger. The natural hues, local materials, and metallics maintain a modern transitional design approach where a traditional rustic feel lives concurrently in a very modern kitchen. View our gallery of Modern Barn kitchen designs in our portfolio showcase.